While Sunset Park was once primarily known for its Costco, the neighborhood is now celebrated for far more than wholesale grocery items sold in packs of 48. 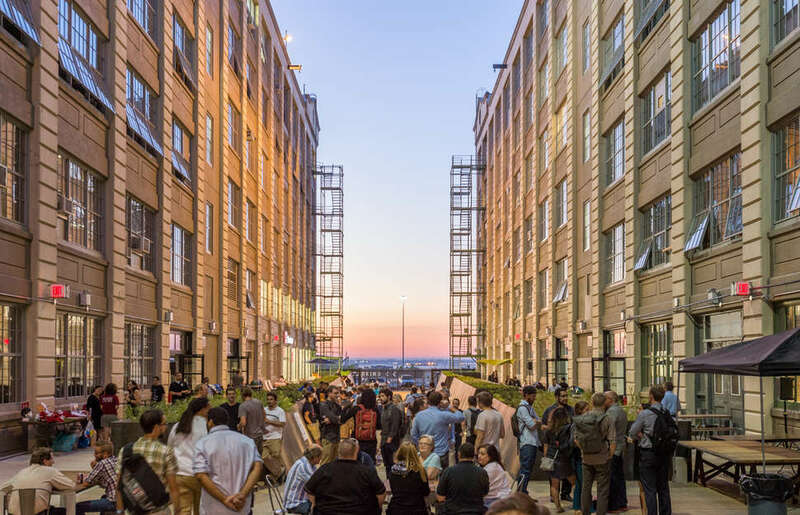 In addition to its authentic global fare (like some of the city’s best tacos and dim sum), the neighborhood has also been attracting hoards of visitors for another reason: Industry City. So, what is Industry City? New York’s answer to Silicon Valley? 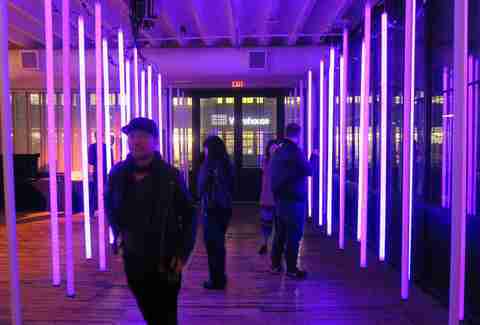 A rave space? A think tank for meme artists? The short answer is all of the above. Formerly titled Bush Terminal, IC is a collection of enormous warehouses stationed from 32nd to 37th Streets on Third Avenue, and from 39th Street to the waterfront on Second Avenue, each of which was once part of the waterfront’s intermodal shipping, warehouse, and manufacturing complex (each individual building spans the full surface area of a city block). 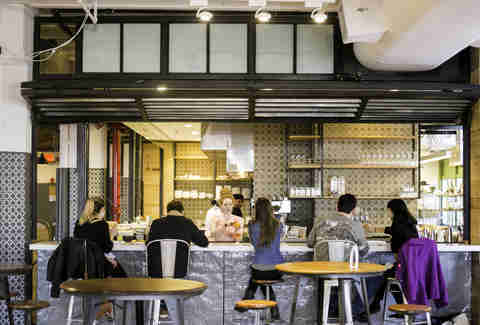 Like Chelsea Market, each warehouse still pays homage to its industrial roots with exposed piping, heavy iron doors, and large freight elevators -- but with the added amenity of rooftop films, chocolatiers, and $18 cups of drip coffee. With 6 million square feet of repurposed warehouse space, the area is now the home base to over 400 companies specializing in everything from film and architecture to fashion and food. Here’s everything you need to know about how to get there and what to eat, drink, and do when you arrive. Take the D/N/R train to 36th Street in Brooklyn, or catch the B35/B37 to 39th Street. 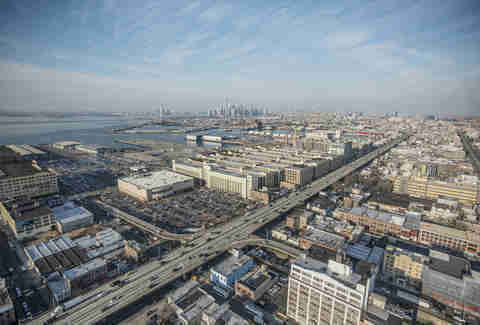 Or technically, you could try swimming across the toxic expanse of the Gowanus from Brooklyn Heights’ Ikea waterfront. Or take a Lyft. Rest assured, you’ll never be short of a caffeine hit in Sunset Park -- Industry City’s food hall has eight different artisanal coffee vendors. 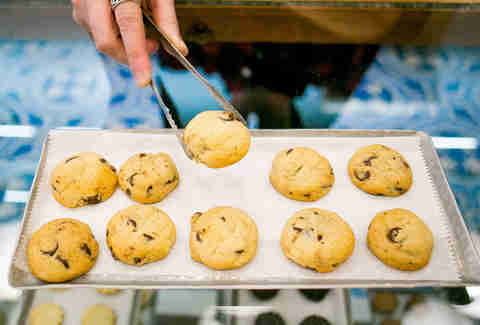 One Girl Cookies, a local bakery specializing in whoopie pies, serves Joe Coffee at its full-service espresso bar; Blue Marble -- the organic ice cream spot opposite -- serves La Colombe; Bangkok B.A.R. boasts sweet Thai iced coffee; and for the more refined coffee consumers out there, the Alpha Dominche Extraction Lab exclusively offers drip coffee, ranging from a $4 Toby’s Estate blend to a people-seriously-pay-it $18 Panamanian brew. If you venture one building over from the food hall, you’ll find Maglia Rosa, where the multitalented staff craft quality, lightweight bicycle frames and fantastic Italian espressos. Industry City’s food hall is like a permanent Smorgasburg set in a New Jersey mall food court -- only better. The place has communal seating, bussing stations, and long rows of food kiosks with menus hung above service counters. Each of the eateries produces its fare on-site: Behind each kiosk, patrons can watch bakers roll croissants, butchers cure meats, and chocolatiers spread cocoa into molds. The only downside is that the whole place shuts down at 6pm on weekdays, so it’s strictly for breakfast and lunch till the weekend. Ends Meat (by the Third Avenue end of the food hall), is a whole-animal salumeria specializing in dry-cured meats sold by the pound. Beyond cold cuts, it’s known for its sandwiches -- none more so than the muffaletta, which comes topped with sopressata, mortadella, provolone, and parsley caper oil. Down the hall, an outpost of Harlem’s popular Taco Mix serves a variety of meat and veggie tacos, homemade taquitos, and cheesy chicken tortas. If you’re looking for Asian food, get an order of the famed pork soup dumplings at Yaso Tangbao, or a steaming bowl of spicy pulled-chicken ramen from Boil Boil. The finest dining (as fine as it gets in a food-court context) is at the Filament gastropub -- skirt steak and tuna tataki are the stars of the menu. If you’re here for maximum Instagram value, look no further than Avocaderia, the city’s first restaurant exclusively serving avocado-centric dishes (including an avocado burger). And if that’s not green enough for you, head to Brine & Dine -- the sit-down eatery from Brooklyn Brine -- for salads, veggie burgers, and, naturally, pickles from the enormous pickling and jarring factory stationed in the building. If you’re not totally stuffed after your avocado burger and several hundred maple-bourbon pickles, the food hall offers plenty of sweets to round out your meal. Colson Patisserie, a major pastry supplier for cafes and coffee shops across the city, sells fresh-baked croissants and Belgian confectionery treats. Ninja Bubble Tea has an impressive collection of sweetened bubble teas, ranging from honey and coconut milk to papaya and blueberry. Li-Lac is the go-to chocolate vendor, with an impressive spread of homemade fudges and chocolates (think 2-foot-tall choco-replicas of the Empire State Building), all of which is prepared by chocolatiers directly behind the shop’s display case. What’s the quickest way to draw hordes of New Yorkers to a series of once-vacant warehouses hidden in the far-flung reaches of Brooklyn? Alcohol. IC’s pioneer tenant was the Industry City Distillery, which continues to produce the only vodka distilled in New York City (with a beet sugar base). The top-floor tasting room offers distillery tours, weekend tastings, and panoramic rooftop vistas of the Statue of Liberty and the, uh, golden expanses of Costco’s parking lot. If you’re not quite ready for the hard stuff, attend one of daily tastings of small-batch, sustainable wines at the Moore Brothers Wine Company. Like the food vendors, these places close early during the week, but they’re open as late as 11pm on the weekends, and even later in the summer. Speaking of summer, NYC’s most popular barge-bar, The Frying Pan, operates an outdoor bar/restaurant called the Wheelhouse, on a defunct tugboat stationed in Courtyard 5-6. Not only does the place provide a full-service bar, but it also has ping-pong tables and a nine-hole Brooklyn-themed mini-golf course. And for some one-of-a-kind mixed drinks, all of which are served in hollowed coconuts, hit Bangkok B.A.R., where you can sip cocktails like the P’Cow sangria, with white wine, fresh grapefruit, and orange soju. IC has its very own gallery with a rotating series of exhibitions curated by the Dedalus Foundation -- an organization dedicated to the supporting the exhibition and distribution of modern art. The work is replaced seasonally, so swing through and then come back when the weather changes. Next door to the food hall, BHQFU, a New York-based artist collective, offers a series of free community art classes, and biannually, IC holds an Open Studios event, where the complex’s creative tenants open the doors of their private studios to the public (check the dates on the Industry City Studios website). When it comes to retail, Industry City has become a design hub, especially in the realm of large-scale furniture production; wander through the latest outpost of ABC Carpet & Home for one-stop home goods shopping, and for some serious deals on outrageously high-end designer furniture, get lost in the Design Within Reach showroom. At Flavor Paper, grab some custom, hand-screened wallpaper, or stop by Maglia Rosa for locally built Italian bike frames. 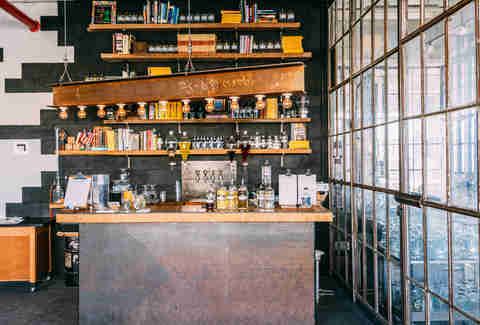 And finally, at the WantedDesign store, realize your wildest bar and kitchen dreams (think coffee table books and hand-blown stained-glass ashtrays). Occupying 6 million square feet of real estate comes with many perks, not least having ample room for activities. 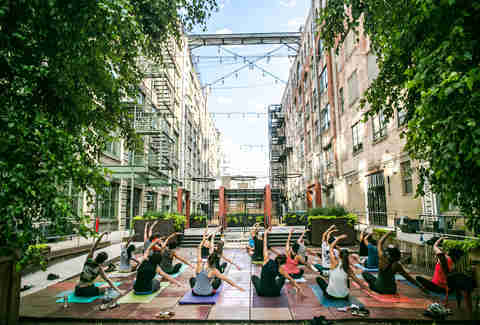 Industry City’s food hall offers its own gym (to help you right the wrongs of that chocolate Empire State Building), courtyard sunset yoga classes, open-air concerts (where dancing is more than encouraged), and -- if you’re really feeling ambitious on the athletic front -- you can try crashing the Nets' warmup. Beyond the free art lessons at BHFQ, Williamsburg’s Brooklyn Kitchen hosts a series of weekly cooking classes inspired by the area’s diverse local dining; you can study Italian sauce-making, craft cocktail technique, and dumpling preparation. Building Five is home to Camp David, a co-working space from the founders of Milk Studios. It’s specifically geared toward Sunset Park’s creative community, complete with professional-development seminars, collaborative workshops, and advising services for freelancers. Next door, the Innovation Lab follows similar principles. It’s somewhere between a job placement service and a vocational school, allowing Sunset Park locals to learn trade skills that lead directly into employment at one of the neighboring new businesses. 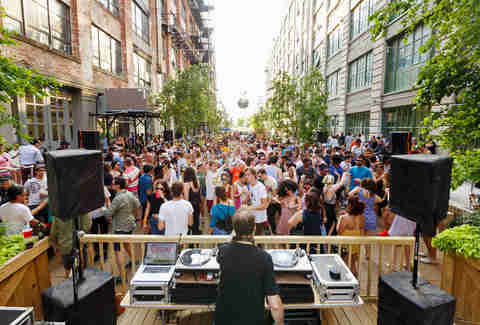 During the summer, Brooklyn Bowl hosts ticketed and free live concerts on Wednesdays, Thursdays, and Saturdays outdoors at Courtyard 1-2, and the area’s spacious warehouse roofs make a prime venue for movie nights with Rooftop Films. In the winter months, IC hosts an indoor rendition of Smorgasburg and Brooklyn Flea, along with a holiday-themed outpost of Chicago’s Renegade Craft Fair (featuring essentials like artisanal turmeric aftershave and, say, a needlepoint recreation of Future lyrics). Beyond the slew of markets and fairs, you can craft festive decorations at family workshops, listen to speakers from local podcasters The Listening Booth, or come to Thrillist’s very own Holiday Hideaway party to wrap presents, sample tasting menus, and clink festive cocktails. Eliza Dumais is a writer who likes drinking in once-vacant Brooklyn warehouses. Follow her for proof @elizadumais.